In a speech to the Anglicans in Canterbury England, Vatican-based Cardinal Walter Kasper reiterated his earlier position admitting that there was NOT a single bishop who ruled all of Christendom from the beginning. 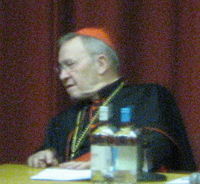 But Cyprian goes even one step further: he not only emphasises the unity of the people of God with its own individual bishop, but also adds that no one should imagine that he can be in communion with just a few, for “the Catholic Church is not split or divided” but “united and held together by the glue of the mutual cohesion of the bishops” (Ep. 66,8)…(Kasper, Cardinal Walter. Cardinal Kasper to Anglican Communion “The Aim of Our Dialogue Has Receded Further”. CANTERBURY, England, JULY 31, 2008 (Zenit.org)). Cardinal Kasper is not the only Roman Catholic scholar to admit this. The truth is that informed Catholic scholars know that what most people think happened (Peter was bishop of Rome and anointed Linus to take the “cathedra” to rule over all of Christendom who then passed it on to a line of bishops simply is not the case. The truth is that the Roman Catholics (and Eastern Orthodox for that matter) simply do not have the type of apostolic succession that their members have been normally led to believe that they have. The only universally accepted apostle to “bishop” transfer of leadership for the 1st and 2nd centuries that continued until at least the end of the 2nd century was through Polycarp of Smyrna. And while the Catholics and Orthodox claim Polycarp to be one of their saints, the truth is that only the Church of God has the same teachings and practices of that original church (such as Passover and the Millennium–teachings that were later condemned by the Greco-Roman leaders). Melito of Sardis Who was this 2nd Century Church Leader? What Old Testament did he list? What did he teach that most who call themselves Christian later change? Thraseas Thraseas died circa 160 in Smyrna, but oversaw the churches from Eumenia. Sagaris Sagaris died circa 166-167 and oversaw a church in Laodicea of Asia Minor. Papirius He died circa 170 and oversaw churches from Smyrna. Polycrates of Ephesus He was an early church leader that claimed to continue the practices of the Gospel, John, Philip, Melito, and Polycarp, while refusing to accept traditions that came from Rome. This entry was posted on Sunday, August 3rd, 2008 at 5:50 am	and is filed under Church History, Doctrine. Where Were the Early Christians Located?